Please choose a category below for further information. If our FAQ section has not answered your inquiry, please contact us via email, live chat, or telephone, and our customer support team will be happy to assist you further. • How does OneLotto work? OneLotto is a website that allows you to play the Biggest Lotteries in the world through our Lottery Ticket Purchasing Service or also know as Messenger Service. You do not need to fly to the country where the lottery game is based because we give you the power to play whenever and wherever you may be. • Who is eligible to Play on lottery games at OneLotto? • What is a Syndicate? A syndicate is a team of lottery players who pool their resources together to buy more tickets and share any winnings between each member. The chances of winning become higher because of the shares for multiple tickets. • Is my personal and payment information protected on the site? • Why is my payment method refused? If you have not used your card with us before, your card provider may not recognize OneLotto descriptor that will appear on your card statement. Certain card providers may require you to confirm your transaction before they process and approve it. If you are having trouble with your selected payment method on our site, make sure to follow the instructions in the error message that you received. You may also contact our support team here. • How do I receive my winnings? All winnings will be transferred to your OneLotto Account automatically. From there, you may withdraw your winnings to your designated payment method or leave all or part of your winnings to your OneLotto Account for future participation. To withdraw winnings please go to your accounts page > Withdraw Funds section to view the options available. For Jackpot and large 2nd tier wins we will immediately contact you to direct and guide you through the process . This will based on your location and amount won. We offer full legal assistance to ensure you receive your winnings safely. OneLotto is a website that allows you to play the Biggest Lotteries in the world through our Lottery Ticket Purchasing Service or also known as Messenger Service. You do not need to fly to the country where the lottery game is based because we give you the power to play whenever and wherever you may be. OneLotto.com is owned and operated by Ardua Ventures Ltd. We also own and operate lottery-millions.co.uk. Since 2008, Lottery Millions has provided thousand's of long-standing customers from all around the world the ability to play lotteries online. • Who is eligible to purchase lottery tickets on OneLotto? • How can I receive discounts when purchasing tickets on OneLotto? Free Play Rewards - get reward points for every line you play. Accumulating 25 points gives you 1 Line for FREE. See details here. Multi-draw – play future draws in advance to receive various discounts. To use this option, go to "Play Lotteries". 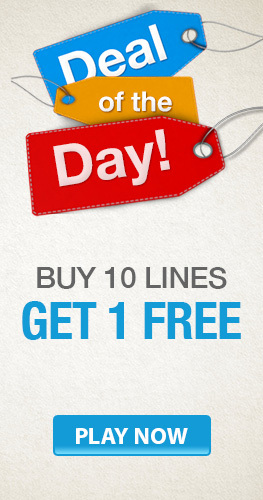 Buy 10 Lines Get 1 Free – for every 10 lines you play for one draw, you will receive your next line for free. This applies across all the lotteries. Promotions – OneLotto will continually be offering you great promotional plays. View our Promotions page to see our latest offers. • What are the advantages of purchasing lottery tickets with OneLotto? Play international lotteries online from anywhere in the world. Enjoy playing lottery in your own convenience from your personal computer or mobile device. Expect fast and efficient automatic transfer of your wins. receive FREE lottery result alerts and jackpot alerts. • How do I start playing? To start playing your favorite lottery games, you should sign-up an account to the site using your email address. To do this, please click the Join Now button. After signing up, select the lottery game that you want to play. 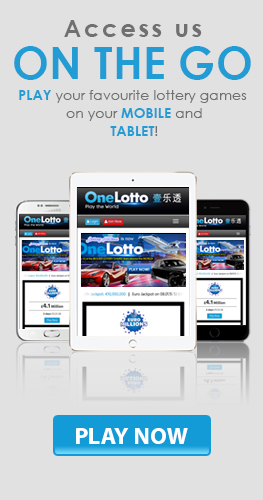 You can now play your favorite lotteries with OneLotto, from the comfort of your home or on the go. • How do I select/change my default currency? OneLotto supports three International currencies - Great British Pound, Euro and US Dollar. Your default currency will be chosen automatically by your location. If you wish to change this default currency, you may send us an email at support@onelotto.com . No. If you wish to change your username, you will need to create a new account with a different credit card and email address. Please know that your username is relevant for sign in purposes only and it does not correspond to your actual name. You have the option to close your account and set up a new account. • Can I login using my username? Yes, you can login with either your username or the email address that you registered with. In case you forgot both your username and email address, you may contact our support page. To change your password, click the "Change Password" link under your "My Details" page, input the new password that you wish to use and then save changes. If you can't remember your password, you may use this link. • Where can I view the summary of all my transactions on the website? Under "My Wallet", please click "View Transactions" to view the summary of all your transactions including deposits, withdrawals, wins, one-time entries, subscriptions and multi-draws. • How do I close my account? If you wish to close your account and be removed from our Mailing List, please contact us at support@onelotto.com. Note: Your OneLotto account needs to have zero balance to proceed in closing your account. • How do I unsubscribe from email and SMS alerts? You will have the option to opt out or deactivate Alerts and Notifications in your My Account page. You can also unsubscribe to Email Alerts and Notifications by unsubscribing to our emails. Alternatively, you can contact our support team at support@onelotto.com. We will process your request as soon as receiving your email. • How will I know the rules of the different lotteries on OneLotto? Playing lotteries online is very easy. You just need to choose your numbers then click "Purchase Ticket" to submit your form. You will see a step-by-step guideline in each lottery page so there is nothing to worry about. OneLotto will make sure that you will submit a valid lottery form. To learn more, please see our Lottery Information page. • How do I confirm that my order was successfully posted? Make sure that you click the "Purchase Ticket" button in the Play Lotteries page after you have chosen all your numbers. You will receive a "Congratulations" message confirming that your transaction is completed. You can find this into your "My Account" page. We also automatically send you order confirmation email on the completion of your purchase. • How will my ticket arrive? Upon completion of your purchase, you will receive your OneLotto official ticket(s), which can then be viewed within your “My Account“ page. • What if I don't receive my ticket? When you play with OneLotto, you will receive a username and password to access your "My Account" page where you will be able to view your tickets at any time. If you feel there is any error, you may contact our support team 24/7. • Can I purchase tickets in advance? Yes. You can play for future multiple draws by choosing your playing weeks, which can be viewed on the play page. • What is the minimum line to purchase? There are no minimum lines to play all the lotteries on offer at OneLotto. • What is the cut-off time to purchase tickets? Draws close on the site two hours prior to the local draw cut-off time. To view the local draw time for each lottery game, please refer to our "Lottery Information" page. • What are the different ways to select my numbers when playing a lottery game? You can manually select your numbers by manually entering them on to the line, clicking on our number grids or using our number wheel. You can also use "Lucky Pick", our random number generator. • What is a Syndicate share? Each Syndicate Game is split into a fixed number of shares (parts). Every share has a fixed price. You can buy as many shares as you want as long as it is available and within the set shares of the game. • How are Syndicate winnings computed? Total winnings are divided up into a share value. Each share value is then credited to each player according to how many shares they have purchased. Winnings will be automatically credited to your OneLotto account once the draw results have been published. • Where can I find my CVV number? The Visa, MasterCard and Diners CVV numbers appears on the back of your payment card. It consists of three digits and can be found next to your signature. • What payment methods are offered on OneLotto? OneLotto makes sure to offer variety of payment methods that will be convenient for all the customers' needs. To see the full list of payment methods that we offer please visit our Payments page. • What currencies does OneLotto accept? We are accepting Great British Pound, Euro and US Dollar. To update your default currency and payment method, please contact us at support@onelotto.com. If you have not used your card with us before, your card provider may not recognize OneLotto. Certain card providers may require you to confirm your transaction before they process and approve it. • Can I get a refund for my ticket? No. When you confirm your purchase online, the order form will be sent to one of OneLotto local offices and representatives purchase the tickets. The process continuously happen all throughout the day until the closing time approaches. As a result, we are unable to cancel an order that has already been forwarded to the local offices, thus we cannot refund your ticket. • How do I change my default payment method? To change your default payment method, please edit necessary information in your "My Payment Details" page. • How do I delete my payment method? To delete your entered payment method, go to your "My Payment Details" page and click the trash bin icon. • How do I deposit and withdraw funds from my account? To deposit funds to your account, go to your "My Wallet" page then choose "Deposit Funds" and follow the instructions stated there. To withdraw funds from your account, go to your "My Wallet" page then choose "Withdraw Funds" and follow the instructions stated there. • When are the lottery results updated on the site? Once the official lottery draw has taken place and full prize breakdown have been officially announced, OneLotto will post the complete result breakdown on the website. This process will normally be completed after 3 hours the official draw has taken place. • Where can I view the lottery results? You can check out OneLotto Results page for complete result and prize breakdown. We will also send an automated email notification containing the results to all participants of the draw. • Does the order in which numbers are drawn important? The order in which numbers are drawn are not important or relevant. The results are always published in ascending order. • How will I know if I have won? After each draw, OneLotto's system will automatically check your tickets for any matching numbers and winning combinations. We will send email notification to all the winning ticket holders. All prize winnings will be automatically credited to your OneLotto Account Wallet. For ticket history, it can be viewed under OneLotto Account page including under section "Winning Tickets". • What are jackpots and winnings that are taxed? Certain winnings may be subject to local tax before they can be transferred to you. If you are eligible to jackpot winnings, our customer support team will contact you to discuss your withdrawal or transfer options. We also advise that you consult your local tax authority to find out more about your local tax regulations. • Does OneLotto share any commission on my winnings? All of the winnings in OneLotto are commission-free, regardless of the amount. If you choose to receive your winnings via bank transfer, a bank transfer fee from your bank may apply. • Is there a tax requirement on my lottery winnings? OneLotto do not pay any tax on your winnings when you claim them from us. However, you are responsible for paying any taxes due to your own Government when depositing into your Bank Account. In the case of any large win, we advise that you consult your local tax authority to find out more about your local tax regulations. • How can I withdraw funds from my Account Wallet? To withdraw funds from your Account Wallet, please visit your "My Account" page and under "My Wallet", click "Withdraw Funds". Your account will inform you of the available funds that you can withdraw. Decide how much you wish to withdraw then choose your payment method and finally click "Submit" to proceed.